The Chief Executive Officer of Kofikrom Pharmacy, Kofi Addo Agyekum has fulfilled a promise he made to members of the K-Balm Armwrestling club who represented Ghana in the 2018 Africa Armwrestling Championship. 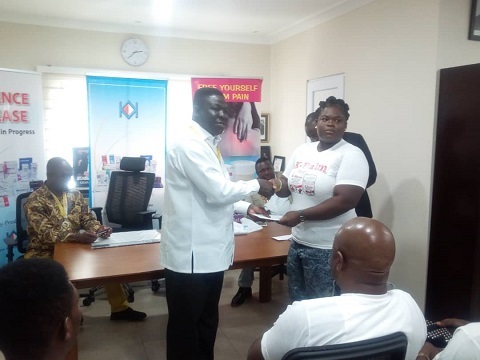 Kofi Addo Agyekum who is also as the vice president of the Ghana Armwrestling Federation in an attempt to motivate the arm wrestlers ahead of the tournament pledged a reward package for athletes who will win gold medals in their competitive categories. His words yielded the needed result with members of the K Balm Armwrestling Club winning 17 of the 88 medals won by Ghana. In his presentation speech, Kofi Agyekum indicated that due to the team’s sterling performance at the tournament he has decided to extend the prizes to the other medal winners. He commended them for a good job done and encouraged them not to rest on their laurels. “I’m very happy today because prior to the championship, I went to media houses telling them that the least number of medals we are winning is 40. In fact, the pharmaceutical fraternity started calling me a prophet. When we hosted and won, I was so elated. I prophesied 40 and you gave me 88, it was an amazing feat”. “I look at the number of athletes we fielded for team Ghana, coming from K Balm Armwrestling Club and look at the number of medals you have brought us this afternoon and I want to say a very big thank to you for making us proud. I want to honour my promise as I said before the tournament. The plan was to reward only those who won gold but when the committee met we decided to reward everyone who did us the honours by representing Ghana”, he said. The coach of the female team of the K- Balm Armwrestling club Alberta Ampomah expressed gratitude to Kofi Agyekum for his unflinching support to the club. Present at the ceremony were the President of the Ghana Armwrestling Federation, Charles Osei Assibey, the President and vice president of Ashanti Regional Armwrestling Federation.